Take heed, Guardians; Bungie has detailed all of the content included in Destiny 2‘s imminent console Beta, which begins for all players on July 21st. Those who choose to pre-order the shared-world shooter ahead of time will gain access to the testing phase from July 18th and July 19th on PlayStation 4 and Xbox One, respectively, as per Sony’s ongoing content partnership with Activision. Content-wise, Destiny 2‘s Beta touts the sequel’s opening story mission, a Strike, and two PVP modes, one of which is the all-new Countdown. Further details on what you can expect, along with the specific start and end dates for each platform, can be found below. 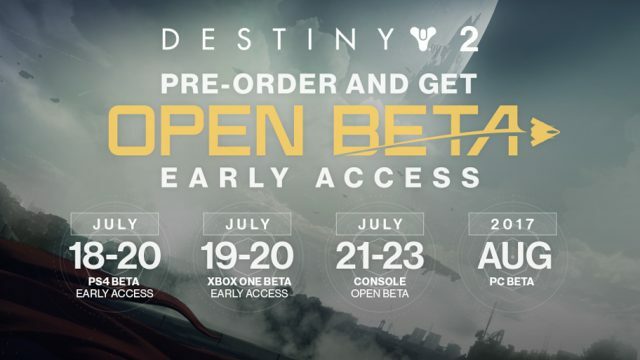 It is, however, important to note that while Destiny 2 is coming to PC, Bungie plans to host a separate Beta test for the platform at a later date – August 2017, to be specific, and we’ll keep you right up-to-date as the studio begins to zero in on an official start date. Moreover, there will be no Clan support or character progression in the Destiny 2 console Beta, meaning your progress won’t carry over to the full game. You will, however, be able to earn a particularly eye-catching emblem for partaking in Bungie’s pre-release testing period. Check it out here. Those aforementioned Crucible game modes include the familiar Control and Countdown, a mode in which Guardians lobby for control of a base. Bungie has stated in the past that online maps have been custom-built for the all-new Countdown, so it’ll be interesting to see how players react to those fancy arenas in two weeks’ time. Here’s an overview of all that Beta content, which includes The Farm, a new social space in which Guardians can “kick the ball into the net or befriend a chicken.” Take our money, Bungie. Take it all. Homecoming – The opening mission and cinematics from Destiny 2’s Campaign. Countdown – Enter the Crucible to battle other Guardians in a brand new mode. Attack or Defend the base on a new map custom-built to support this new game type. Control – The original standard for Crucible combat is back, with some impactful changes. Control the zones on another new map built with this objective in mind. The Inverted Spire – Strike at the heart of a Vex stronghold. Bring two willing allies, or let Matchmaking introduce you to a Fireteam of Guardians. New Subclasses – The new fighting style for each Class will be at the ready. Choose from the Dawnblade Warlock, Arcstrider Hunter, or Sentinel Titan. The Farm – For one hour, on Sunday, July 23, we’re inviting you to tour the new social space in Destiny 2. Starting at 10am Pacific, you’re welcome to kick the ball into the net or befriend a chicken. Most vendors and services will be offline. Our goals are to see how many of you The Farm can accommodate at once. Those on PlayStation 4 and Xbox One can expect Destiny 2 to launch on September 6th, before Bungie’s long-anticipated shooter sequel makes the journey across to PC in time for September 24th.